More of The Vampire Chronicles - where dark pleasures and glorious decadence abound. Anne Rice once again creates the hypnotic, mythical world of the undead. Here is the story of the dazzling and seductive vampire Lestat, whom we first perceive as evil incarnate. We travel with Lestat from the licentious Paris of the 18th century to the pagan courts of ancient Egypt to the frenzied 20th century world of rock superstardom, as he elusively searches for the roots and meaning of his own immortality. As he does so, our sympathy is more and more engaged and we come to recognize that he is, in fact, a questing romantic, a vampire hero - with his own strange and passionate sense of courage and morality. The Vampire Lestat is Volume 2 of The Vampire Chronicles. For a full selection of Anne Rice programs and to hear the author answering fan mail, visit the Anne Rice store. ©1985 by Anne O'Brien Rice (P)1989 by Random House, Inc. I listened to this as an abridged audio book and I very disappointed with the violin music that should have been in the background. Loud and screeching I think are two good words to describe the 'music' and usually music stops just after the reader starts speaking, but this one didn't and it kept coming back. The violin was in the foreground when it was playing and was really awful to listen to while trying to hear the story. Ignoring the Violin music ... I still did not enjoy this one as much as the Interview With A Vampire. Also, because it was abridged, I think they took too much out. If I had realized it was abridged before I got it, I probably won't have bought it. Sometimes the second in the series can never be as good as the first, but I always hold out hope that the author has learned better writing and descriptive skills and so it 'could' be better. That being said, I think I would still read another in her vampire series. I might even go and get the actual book and read it to see how much I missed. No, I think both complement each other. 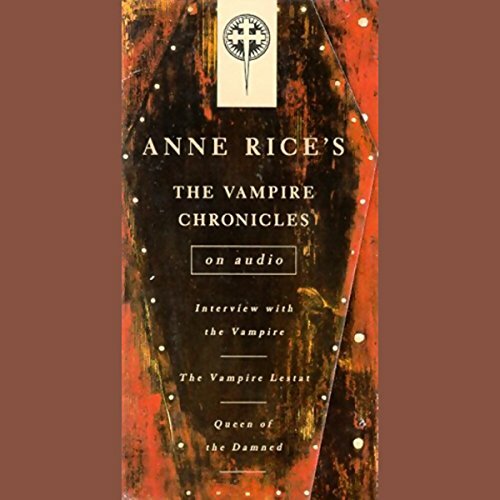 The rpint version lends itself to create an aura of what one would consider Lestat whereas the narrator of the audiobook puts his own spin on bringing the character to life for us. What other book might you compare The Vampire Lestat to and why? No books can compare to this wonderous tale of wunderlust and everything else in between. I did see myself drawing comparisons of Lestat and his personality to characters like Duncan McLeod, the Highlander and the Crow. He brought the tale to life. Yes, the scene in the crypt with Akasha and Akil, and Marcus. The violin transitions in the audiobook deserve to be toned down a bit so you can better engage your listening of the narrator and the tale. It could sometimes be very verbose and distracting. I loved this book. i accidently read this book first, before Interview with the Vampire, and found that i like the Lestat that we see in this book better the in Interview with the Vampire. Lestat, the wolfkiller, and superstar. Lestat is by far my favorite character of all the Vampire Chronicles. He's brash, bold, and insolent but also very human (for a vampire) and understandable. I did listen to the whole thing in all one sitting and then was very confused. Went back and realized it was the Abridged version. As other reviewers have noted, the violin music was annoying. It was recorded too loudly, making it difficult to hear the narrator. But fortunately, you only hear the violin a few times during the story. If you're used to hearing more recently recorded audio tapes like I was, you'll be a little disappointed in the quality of this one at first. But you'll quickly be pulled into Lestat's world, leaving all quality-related issue behind. I thought the narrator did a wonderful job. A good "read"! I'm not the biggest Anne Rice or vampire fan, but this is an excellent performance & is what made me a Michael York fan. The story is a nice installment in Rice's Vampire series. I would highly recommend this to anyone. This is the best book of all, in my opinion. Michael York does an excellent job of narrating. The only complaint I have is that I expected the narrator to have a french accent as Lestat was from France. That's just me being picky though.